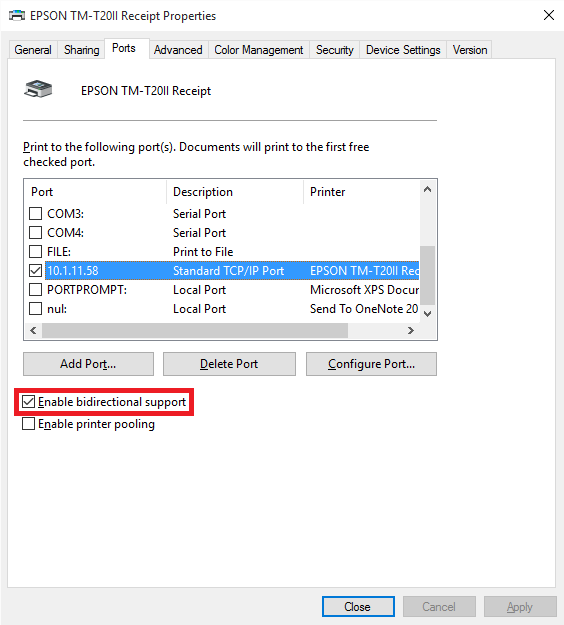 After installing the printer using the Epson Advanced Print Driver (v5) then attempting to print the test page you may receive the notification ‘Epson TM-T20II Receipt is not available for printing’ followed by a message indicating that the test page could not be printed. In Devices and Printers, the Epson Receipt printer shows Status: not available when selected or hovered over and the title bar displays Not Available when viewing the print queue. The Epson APD v5 assumes that your computer has full two way communication with the printer. This is not always correct. If your printer is on a separate network or is behind a networking device that blocks certain types of network traffic (sometimes a wireless access point or router), you may need to disable bidirectional communication and SNMP monitoring. First, remove the existing device from Devices and Printers and restart your computer. Next, start the ‘Add a Printer’ Wizard in Devices and Printers. Choose ‘The Printer I Want Isn’t Listed’, then select the ‘Add a printer using a TCP/IP address or hostname’ and click Next. Choose TCP/IP Device from the Device Type drop down list, then enter the IP address of your printer and click Next. If you don’t know the address, press and hold the pin-hole button on the Ethernet module on the back of the printer for 3 seconds to print the printer network configuration. In the list of printer drivers, choose EPSON in the Manufacturer column, then select the Epson TM-T20II Receipt5 driver in the Printers column and click Next. If the driver is already installed, choose Use the driver that is currently installed. Click Next, then choose a name for the printer, click Next again. Do not print a test page. In Devices and Printers, right click on the Epson TM-T20II Receipt printer that was just created and choose Printer Properties. Click the Configure Port button. 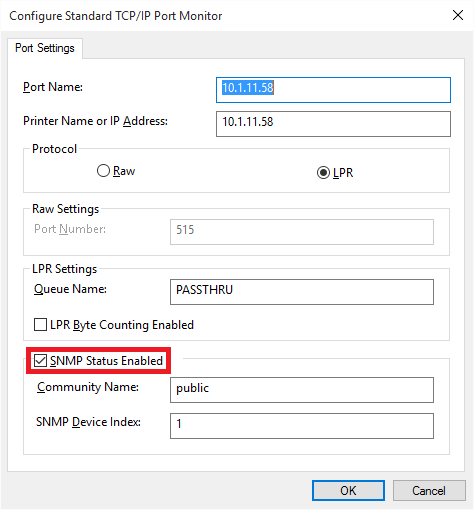 Uncheck SNMP Status Enabled, then click OK.
Click Apply, then OK. Printer status should now display ‘0 document(s) in queue’. If not, reboot your computer and check again. Test pages (and receipts) should now print.